Installing advanced suspended ceiling drops is the next step up from building basic vertical drops. There are some differences between basic and advanced drops and the first is that it takes approximately twice as much time to build an advanced drop verses the basic suspended ceiling drop. The aesthetic difference between the two types of vertical drops is quite noticeable. The basic vertical drop tends to look very boxy. This is due to the overuse of the angle molding. The advanced drop eliminates all angle molding except for the lower angle piece and maybe an outside corner. Building an advanced drop offers you the most professional look possible and it gives the impression that the vertical drop is a continuation of the ceiling. It also gives a sense of dimension to the ceiling that looks fabulous. 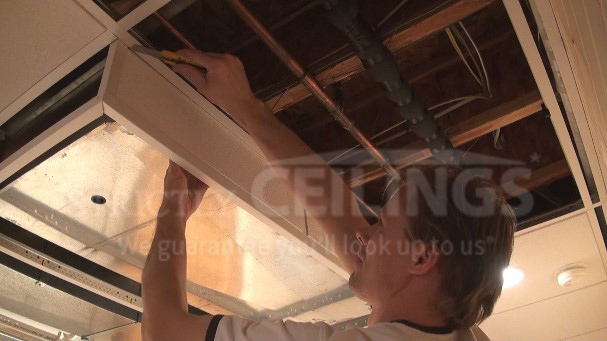 With advanced drops, laying out the ceiling before installation is extremely important as you can’t just place angle molding anywhere on the upper portion of the ceiling like you can when installing basic suspended ceiling drops. All light locations, border sizes and clearances to obstructions must be taken into consideration before beginning the installation. 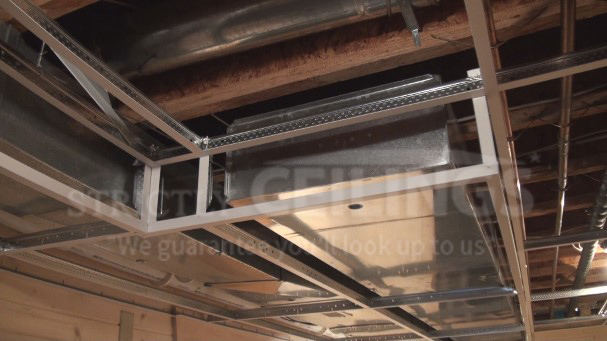 Almost all false ceilings with an advanced drop built into the configuration will have a revealed edge or drop-down ceiling panel installed into them. This means you’ll have to install the tile, scribe the tile, remove it, kerf it and re-install it. This is why maintaining the proper clearances is imperative throughout the installation process. 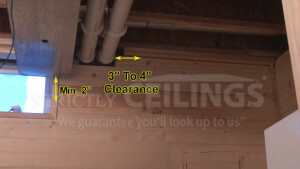 Determine the maximum ceiling height by measuring down from the lowest pipe or electrical box. 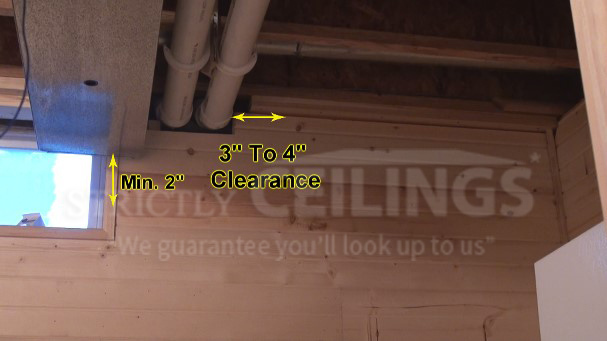 Typically 4” down from the joist is your best bet. The upper ceiling grid must be locked in by rivets or tie wire before the advanced drop begins. You must have a main runner installed along the entire length of where the vertical drop will begin. Purchase a low cost laser as it will come in handy. If you are building the drops yourself, the money that you’ll save by installing it yourself will be more than enough that you can purchase good equipment and still be ahead. Once you have the upper portion of the ceiling grid built and you have the main runners installed alongside the obstruction with the proper clearance, you are ready to install the vertical drop tees. Vertical drop tees are installed much different than with basic drops. Advanced vertical drop tees must be cut in a way that they hang over the top of the main runner and are riveted to it as well. Rough cut the length of the vertical tees and “V” notch out the top of the tee so that it can be folded over the top of the main runner. Punch and rivet it to the main T in every location where there is a cross tee on the upper ceiling grid. Once all the vertical tees have been installed into the main runner and in-line with the adjacent cross tees, the lower angle is now ready to be installed. Set up a laser to begin the lower angle installation. In this case because you didn’t cut the length of the vertical tees you’ll want to do that now. 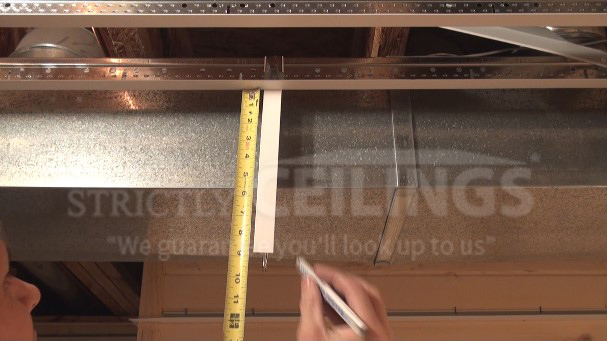 Simply cut the tee ¼” above the laser line, or measure down from the main tee on the upper portion of the ceiling and cut the vertical tee to the proper height. 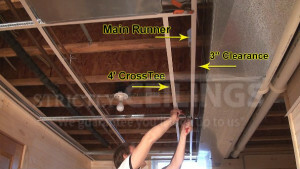 For the lower angle, you’ll be using a piece of wall molding. Place one end of the angle into the 90 degree wall angle piece that you fastened to the wall earlier and place it against one of the vertical drop tees about ¾” down the drop. Place a clamp on the angle and vertical tee to hold it in place. Pop rivet the end of the wall angle into the 90 degree piece. Next, using a speed square adjust the vertical tee so that it’s plumb and after making sure the lower angle is level with the laser line or with the string-line that you installed, pop rivet the angle to the vertical tee. Many times with basic vertical drops we don’t take the time to keep all the tees in-line with each other. However when building an advanced drops all tees must be in-line with each other both ways. 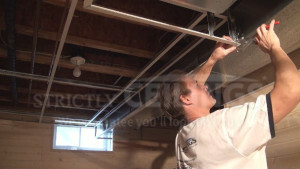 Remember to install the ceiling tiles in tight locations as you building the grid. Take care to run additional string lines if needed to keep the grid straight. Keep the ceiling grid square. Always install the vertical ceiling tiles into the drop before any other tile are installed. 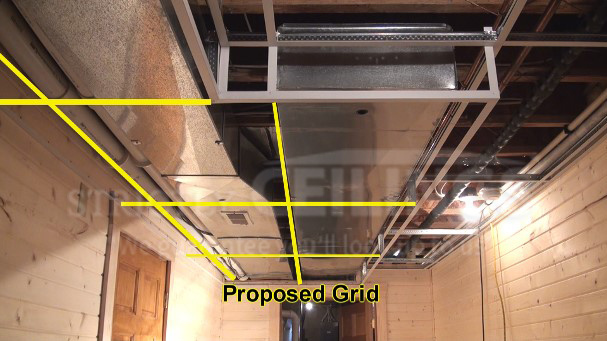 The only exception to this would be if it looks like a ceiling tile would be very difficult to install in a particular area, then install it as you are building the grid work. Watch the full video to learn each step required to build advanced suspended ceiling drops. We’ll also give you professional tips to help you with your project.